« Read our most impactful Inorganic Materials papers of 2017! Read our most cited articles on coordination chemistry from 2017! Coordination Chemistry is one of the cornerstones of inorganic chemistry. Novel combinations of metals and ligands can reveal interesting features of both, and result in complexes with new reactivity and magnetic or spectroscopic properties. Here are some of the highest cited papers on coordination chemistry from Dalton Transactions in 2017. This original research is off to a great start, as some of our most cited work these papers and communications are already being recognized by the coordination chemistry community. A multi-responsive luminescent sensor for organic small-molecule pollutants and metal ions based on a metal–organic framework is reported. Four isostructural 3D lanthanide(III) metal–organic frameworks with the general formula (H6edte)0.5[LnIII(ox)2(H2O)] (Ln = Gd (1), Tb (2), Dy (3) and Ho (4); H4edte = N,N,N′,N′-tetrakis(2-hydroxyethyl)ethylenediamine) and ox = oxalate have been synthesized from oxalate. 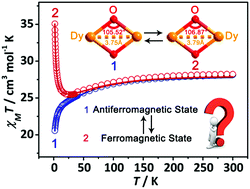 Herein we explored the transitions of two magnetic interaction states (antiferromagnetic or ferromagnetic) upon structural variations in two dinuclear Dy(III) complexes. These Frontier and Perspective articles are receiving a lot of attention online, reviewing the advances and trends that are making waves in the coordination chemistry community. Studies on the extraction of actinide ions from radioactive wastes have great relevance in nuclear fuel cycle activities, mainly in the back end processes focused on reprocessing and waste management. A brief account has been presented on how the inter-heme interactions in μ-hydroxo diiron(III) bisporphyrins and counter anions can induce significant change in the structure and properties including the iron spin state without affecting the overall topology. Submit your research or reviews on Coordination Chemistry to Dalton Transactions – see our author guidelines for information on our article types or find out more about the advantages of publishing in a Royal Society of Chemistry journal.